One year old Lida and eleven week old Carson. We like labs because of their instinctive hunt drive, intelligence, and athleticism, ability to thrive in a cold environment, work ethic, trainability, availability, and willingness to work for more than one person. Lida, and her human handler Michelle, traveled to Stevens Pass Washington this last January to attend the Swiss Avalanche Dog School. Lida was the youngest dog in the group and did exceptionally well during the week at all four phases of the training. 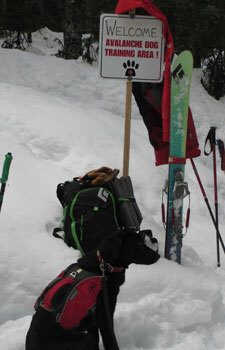 Avalanche rescue dogs also help raise awareness of the hazards involved when travelling in avalanche terrain. Kids love seeing Lida at work and ask to see her during their ski school lessons. She has become an ambassador of the ski area. Lida and Carson are essential members of a dedicated team of ski patrol professionals whose main job is the safety of winter visitors to Lee Canyon and the surrounding mountains.